﻿This is a very sm﻿all 4mm thick and about 30 cm long cable-like lens equipment that ENT surgeons use to examine the nasal cavities, sinuses and throat. This is a very small 4mm thick and about 30 cm long cable-like lens equipment that ENT surgeons use to examine the nasal cavities, sinuses and throat. It will usually be done during your routine out patient appointment. You will be asked to sit up right in the chair and breath normally. The endoscope is then introduced gentle through one of your nasal passages and your sinuses and throat will be visible to the surgeon through the endoscopy. It is not a painful procedure. Sometimes a local anaesthetic may be require to minimize the odd sensation some patients have during the examination. The examination usually takes less than 5 minutes. 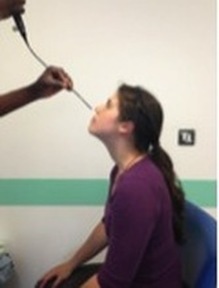 Occassional a local anaesthetic nasal spray may be used. There is no significant complication with this procedure. Very rarely you may have brief and very mild nasal bleeding which stops quickly. The charge varies from £91- £300 depending on the complexity of your diagnoses.